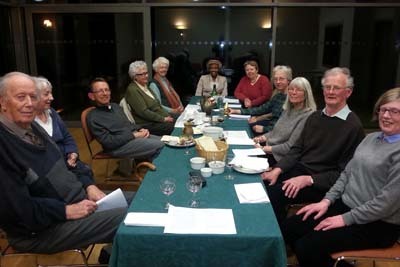 On Wednesday evening just a few more than the 12 disciples met in the Community Room to share a Christian Passover celebration. It is known as a Sedar meal and it is a ritual meal recounting God’s freeing of the Jewish people from slavery in Egypt and to recall Jesus’ Last Supper. The celebration helps to understand how our Christian Eucharist developed out of the ‘Last Supper’ Jesus celebrated the night before his death. As with all activities there are two schools of thought. On the one hand it is argued that Church seders are inappropriate. Why? Some commentators argue that it “does unwitting harm” by treating contemporary Jews as “relics rather than people,” as a dead group from the past rather than a living community in the present. Others argue that when done well a Church seder can deepen a Christian’s appreciation of the Jewish roots of Christianity and provide a meaningful spiritual experience. We achieved the latter on this first occasion as you can see from the attached photographs. The meal consists of unleavened bread, parsley dipped in salt water, a very tasty mixture of meats and fruit plus just a little red wine. Now your appetite has been whet….come along next time.